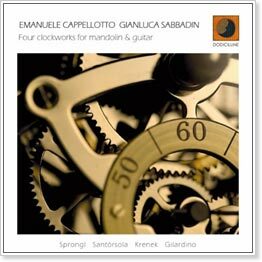 Four Clockworks for Mandolin & Guitar is the title of a new recording from Emanuele Cappellotto (mandolin) and Gianluca Sabbadin (guitar), both of Italy. the 2005 first prize at the European Competition "Enrico Mercatali" in Gorizia. They have performed in important venues such as "Rassegna Internazionale di Nuoro," "Stagione concertistica di Siracusa," 38th Festival Internacional de Logroño (Spain), the Festival of Volubilis (Morocco), and invited to participate in the musical activities of Italian Institutes of Culture of Ljubljana, Bucharest, Wolfburg and Rabat.